Claiming to have ‘Adelaide’s best burgers’, Fancy Burger , located over three burger eateries in Adelaide, is proudly locally owned and operated. But is this really the best burger in Adelaide? I decided to find out what all the fuss is about by visiting the Kensington Gardens restaurant. Upon entering, you’re immediately made to feel at home by the welcoming staff. Despite being quiet for eat in orders, there is a buzzing, frenetic energy about the place. Although not a restaurant in the traditional sense, the eatery has a contemporary retro feel with its exposed brick walls and white subway tiling. On one side the wall is adorned with a blackboard scrawl and graffiti clad artwork. The chefs can be seen flipping burgers in the open kitchen, which adds to the atmosphere. Whether you’re looking for a ‘fancy’ beef, chicken or vegetarian burger, all dietary needs are catered for on the menu. Gluten free options are available for an additional $1 with or without the bun. Mini burgers starting from just $6.90 are also perfect for children or diners looking for a quick bite. The normal guilty feelings often accompanied by a burger meal, are quickly extinguished by Fancy Burger. All of the buns and breads are baked fresh everyday and contain no preservatives or added sugars. 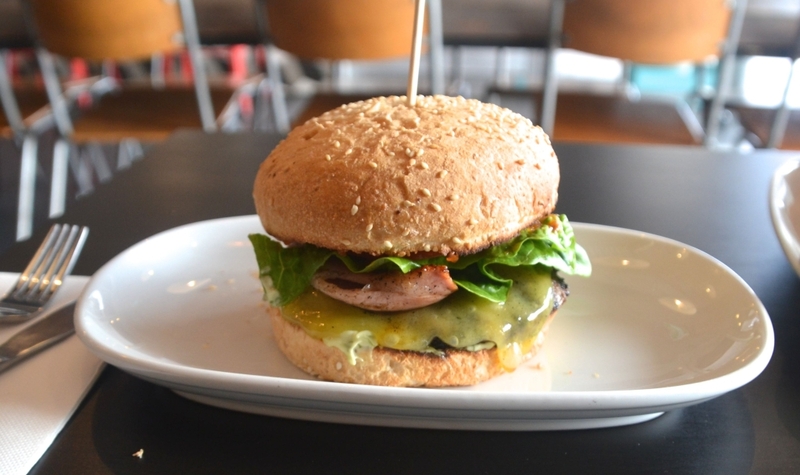 At Fancy Burger local produce is paramount; all of their patties contain no preservatives and come from the South Australian countryside. The service is fast; within ten minutes of being seated the burgers arrived. Phone bookings are also available at Fancy Burger for even extra convenience if you’re in a rush. The most popular burger on the menu is the crispy bacon and cheese burger ($11.50) which is generously filled with a 100% South Australian beef patty, crispy bacon, cheddar cheese, herby mayonnaise, salad and relish. The burger is served in a wholemeal bun studded with sesame seeds. I have a bias for brioche buns when it comes to burgers for their beautiful glaze and light consistency. Unfortunately thus bun was a little on the dry side. The beef patty itself is great, cooked to perfection with a slightly pink blushing centre. Since the patty is 95% it doesn’t have a greasy, sloppy feel. 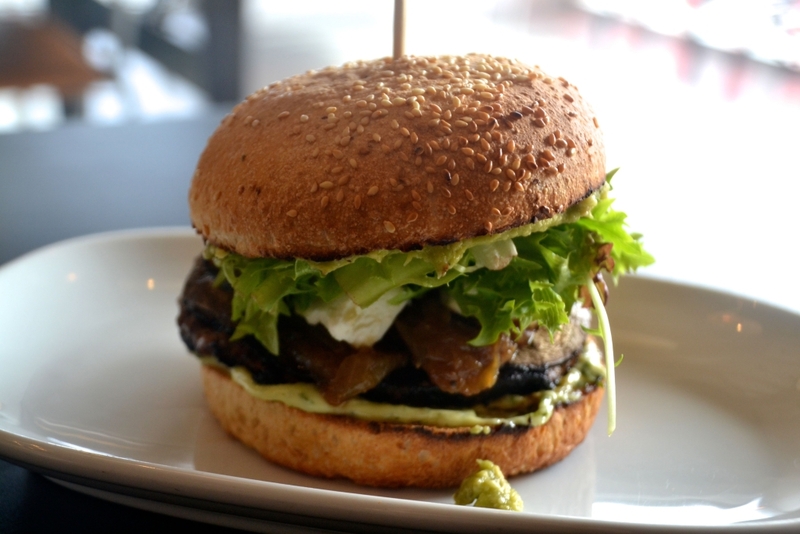 On a special recommendation from the chef, ‘The Legend’ lamb burger ($13.90) is superb. Encased in a seeded wholemeal bun, the burger is filled with 100% South Australian lean lamb, fresh field mushrooms, caramelised onion, chunks of creamy goats cheese and fresh avocado. A welcome palate popping mix of salty, sweet and savoury. A generous dollop of their herby mayonnaise brings together the elements of the burger beautifully. Due to sheer size, this burger is very difficult to get your mouth around but it’s well and truly worth it. A small side of double cooked chips ($2.90) seasoned generously with sea salt and rosemary is enough to round off the perfect quick meal. 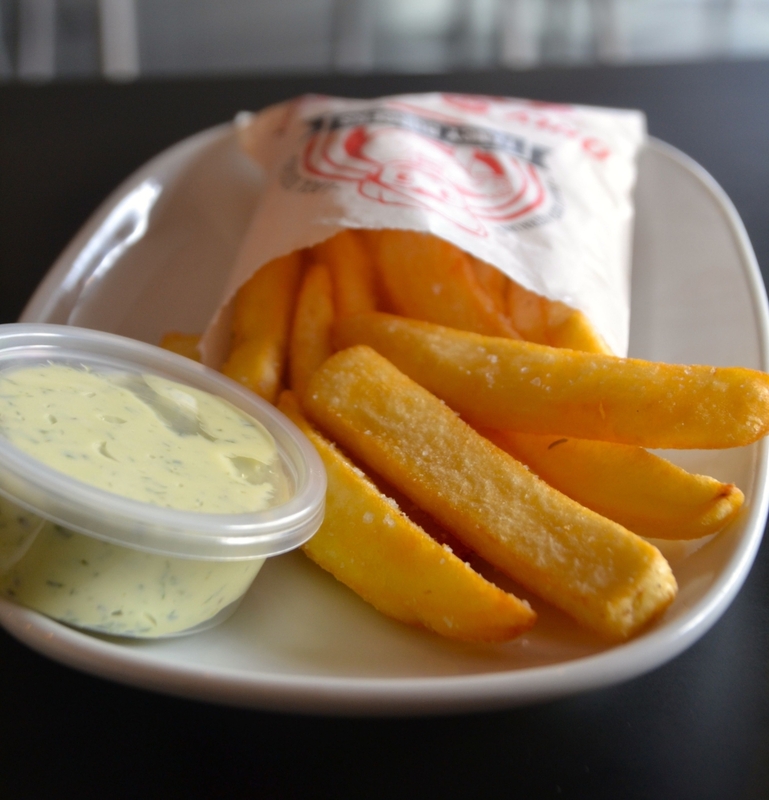 The chips are served with a choice of four sauces – ($1.50 each) – which are all made in house from locally sourced ingredients. BBQ relish, tomato relish, herby mayonnaise and smoked chilli mayonnaise provide an exciting flavour mix. Although it’s a tough call to decide whether it’s the best burger in Adelaide, Fancy Burger certainly didn’t disappoint. It is rather refreshing to see a burger joint with a great attitude for healthy eating and local produce. Who knew that healthy burgers could taste so good? !